In September 2018, more than 20 pilgrims from the UK explored Galilee, Nazareth, Bethlehem, Jerusalem and surrounding areas in an introduction to the places associated with the life, teaching, death and resurrection of Jesus. You can read the full blog and view pictures here and below is Susan Jacobs’ account of the ‘trip of a lifetime’. “We were 22 pilgrims – 14 from Teddington and 8 from further afield, brilliantly led jointly by Bishop Martin and Dean of Newcastle, Geoff, with our own Vicar, Joe, acting as occasional back-up. 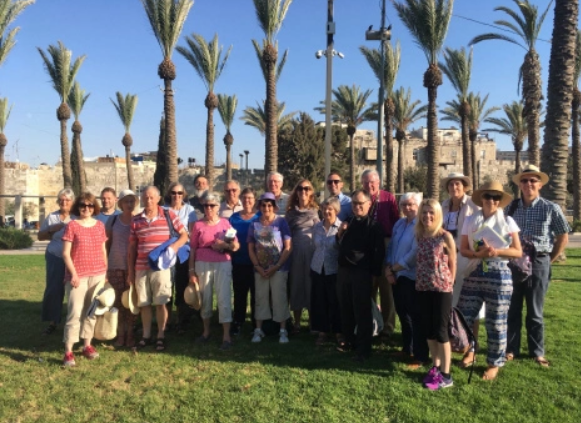 The group bonded quickly as we followed in Christ’s footsteps in a hectic, boiling hot, 10 days in the Holy Land, starting in Jerusalem, continuing in Bethlehem and ending on Lake Galilee. At almost every “site” we had time to worship and to sing, time quietly to meditate, take photographs, admire the art, architecture, views and relics as well as breathe in the spirit of place that was both moving and at times almost overwhelming. Occasionally we were on our own, but more often than not we were surrounded by hundreds of others, from all corners of the world. These multitudes, all celebrating in their own language and fashion, just added to the unique atmosphere. “In the Jordan River near Jericho one of our group was baptised and we rejoiced with him as we all renewed our own baptismal vows; at Cana, in the church built over the site of Jesus’ first miracle of turning the water into wine, 7 couples renewed their wedding vows, and that evening we heard that 2 of our pilgrims had become engaged to be married. “Our Christian Palestinian tour guide was a torrent of fascinating information. He disarmingly avoided questions over which holy sites were authentic and which were less securely authentic, (eg we visited two “Upper Rooms”).